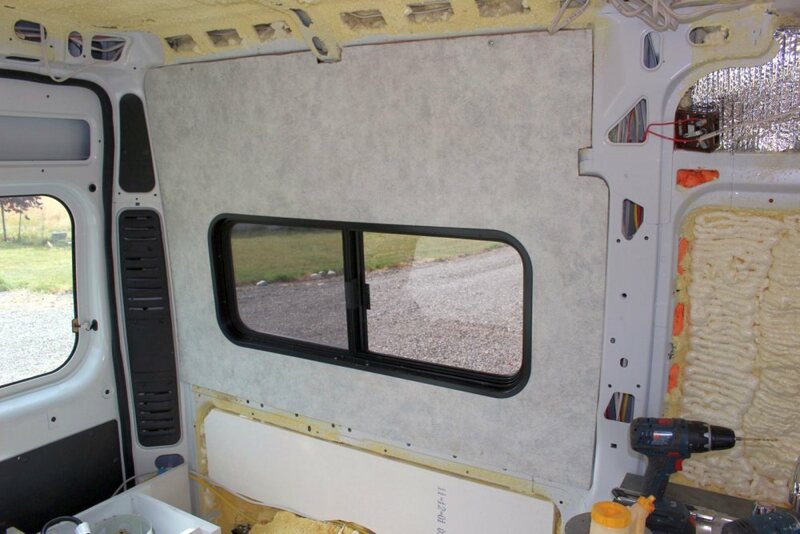 This section covers planning and installing the wall paneling and ceiling panels for our ProMaster camper conversion van. 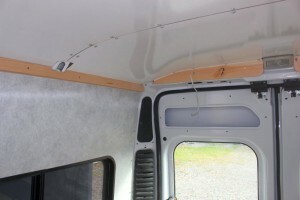 The picture above shows the close to finished wall and ceiling paneling for the camper van. I’ve described what I did in quite a bit of detail below — this is not to say that I think this is the ultimate way to go — there is probably room for improvement in a few places. The choice of paneling is a personal one. We decided to go with something that was pretty light and that had some pattern for the walls. For the ceiling we used white, but that may change to a light colored (and light weight) fabric later. The wall paneling is from DPI (Decorative Paneling International) — they have a number of nice patterns. The ceiling panels come from Home Depot — they are a tempered hardboard with a hard white finish. Update 2018: The DPI paneling we used on the walls has not proved to be a model of durability. Its pretty easy to scrape off the surface or damage the surface. See the comment by Kevin in the comments section for more on this. 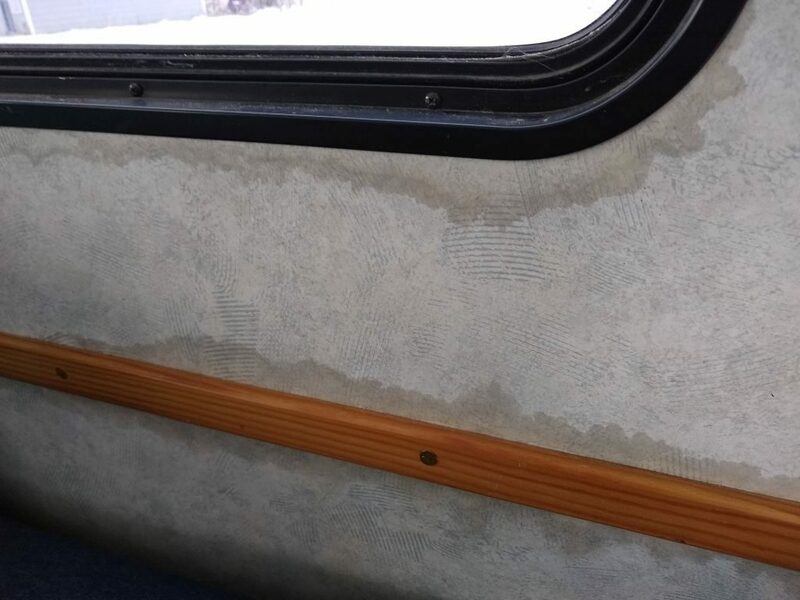 We did think about wood paneling, but our last couple RV’s have been wood paneled and we decided to try something different. I think that plywood paneling is a little more forgiving to work with than this hardboard paneling with a vinyl skin that we used. The bright white ceiling paneling is particularly at good showcasing small flaws or changes in slope. An advantage of the plywood paneling is that its lighter in weight. The total weight of the hardboard paneling we used was about 84 lbs (wall and ceiling). I think that quarter inch plywood paneling over the same area would be less — perhaps 30 lbs less? We were trying for a fairly finished look and got about 80% of the way there. I’m inclined to say that putting up a serviceable set of paneling that does the job well, but does not worry a lot about aesthetics is about a 1 weekend job, but putting up a set of paneling that looks flawless with every do dad finished is a more like a one month job. The first thing you have to decide (after picking the paneling) is whether to go over the top of the ProMaster main frames, or to use the set of surfaces that are at a level about 3/4 inch behind the main frame. Like most conversions I’ve looked at so far, I decided to keep the paneling below the level of the main frame and to have one set of paneling forward of the main frame and one set aft. This leaves you with exposed main frames that we have not decided how to cover yet. The plus side of this is that you gain a bit over an inch of width and you retain easy access to the main frame cavity (where you will probably run a lot of wire. It probably also makes the surface of the paneling more uniform without a sort of gradual bulge for the main frame. I should mention that one of our objectives was to be able to easily remove the paneling to gain access to the wall/ceiling cavity if needed in the future — so, we did not glue anything down. You have to work out some kind of template or measuring scheme to cut out the wall panels. 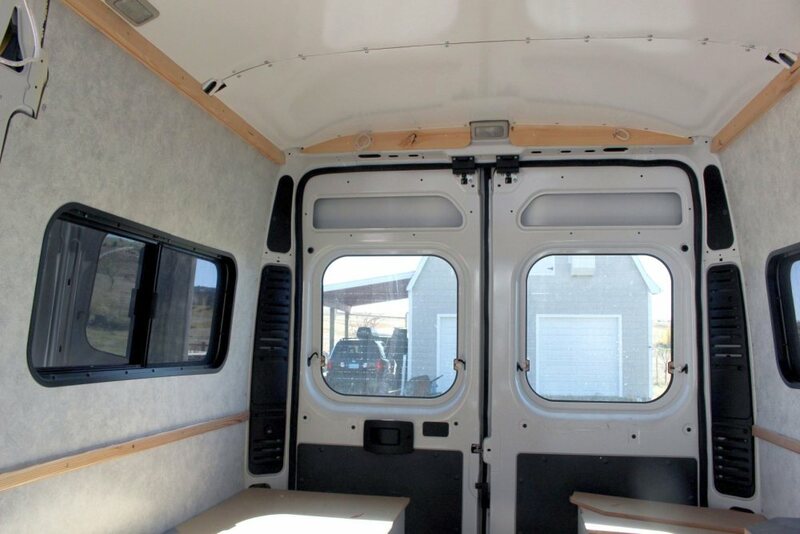 The ProMaster contours are generally pretty rectangular and not to difficult to get right — mostly its just trimming the corners to a rounded shape and working out how to handle the window openings. For the first panels, I used large pieces of cardboard. I would hold the cardboard up in position below the curve around the top, and then trace a pencil line on the cardboard eyeballing where it was to go along with measurements at a few points. Then trim the cardboard to the line you just marked. Then, holding the cardboard up to where it is actually to go, I trimmed back any places that went too far, and marked the places on the template where it fell a little short of where it was supposed to be — usually these were just an eighth of an inch or so. 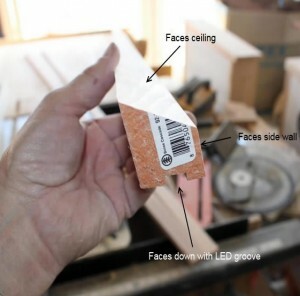 Picture showing cardboard template with the marks to indicate where the final cut should deviate from the template. For one of the other panels, I just took a lot of dimensions without the cardboard template, and that also worked pretty well — aided by the relatively square shape of the PM cargo compartment. 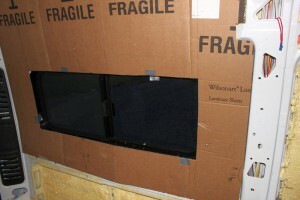 The scheme I worked out for the window cutouts was to measure from the edge of the template to where the window is, then cut an undersize rectangle in the cardboard template that is a half inch or so smaller than the final window cutout will be. 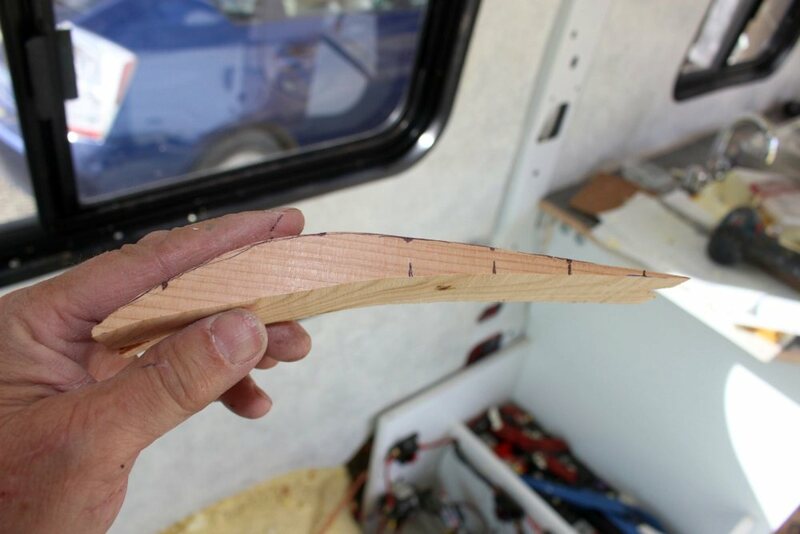 I then placed the template in its final position in the van, and measured from the edge of the template cutout to the corresponding edge of the actual window frame — this marks the exact edge of the window frame on the cardboard template in several places. To get the final cutout opening in the template, 1) lay the template on the floor, 2) place the trim ring over it, 3) position the trim ring on the template using the measurements from the undersize rectangle in the cutout, and 4) once the trim ring is correctly placed, use the trim ring as a template to trace the final cutout location. You may have to adjust the line in our out the thickness of the trim ring material depending on how your trim ring is made. Using this technique, all 3 windows came out right on for the first try. 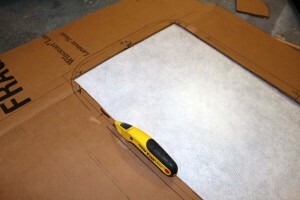 Marking and cutting undersize window rectangle cutout in template. Measuring from rectangle in template to actual window frame so that window trim ring can be precisely located on the template. 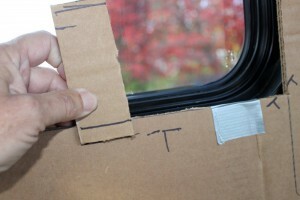 The little piece of cardboard is used mark the distance from the template to the window frame, and then the distance is marked on the template. The trim ring is then laid out over these marks. Using the markings on the template to precisely locating the window trim ring on the template. The trim ring is then traced onto the template. Cutting out the template window opening based on the window trim ring tracing. Before closing off the wall cavity, I added some additional insulation. 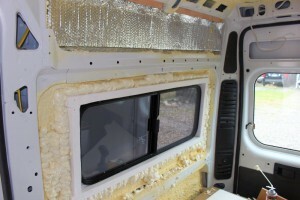 Earlier, the whole back of the van was spray foamed with polyurethane spray insulation, but this still left room for more thickness of insulation in the side walls. 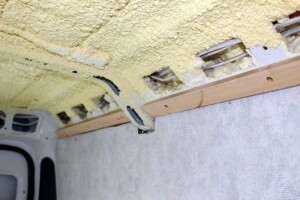 No new insulation was added to the ceiling as the spray foam insulation was close to filling the cavity. 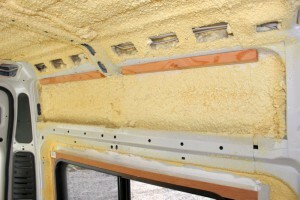 One could fur down from the ceiling ribs to make more room for insulation if desired — this would also provide a nice set of wood members to screw the ceiling paneling to. Used Great Stuff polyurethane foam in can to fill in some of the thin areas near the window where it was not sprayed much. Also used some Reflectex above the window. 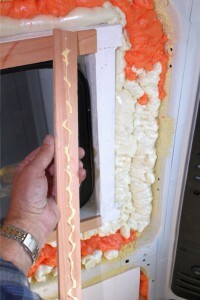 Using some rigid polyurethane foam board in the lower part of the wall — it is glued to the wall using Great Stuff foam. 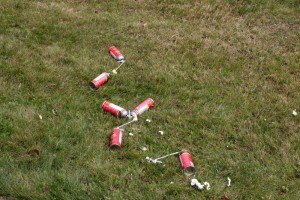 A small part of the graveyard of used up Great Stuff cans. 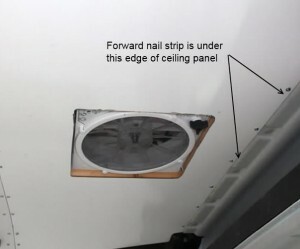 In some places, the wall paneling can be screwed directly to the ProMaster ribs or frames (be careful not to poke a screw through the van skin). But, in other areas there is no backing for the panels. In these cases, I added wood nailing strips to screw the paneling to. Installing wood strips that the paneling will be screwed to. Wood strips ready for paneling. 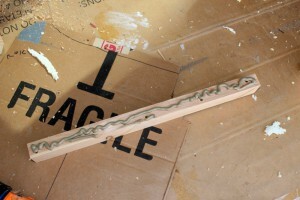 The wood strips shown above are screwed to the PM frames — the wood strips are used to screw the paneling to. The 1/4 inch wood spacer strips that went over the window wood frame. Attached with glue and brads. 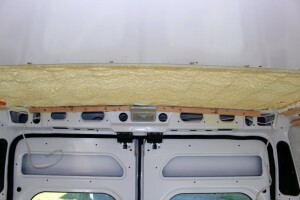 With the spacer strip in place (and with the added insulation). The wall panels were installed with self tapping screws along all the edges where the ProMaster provided a metal surface to screw to. 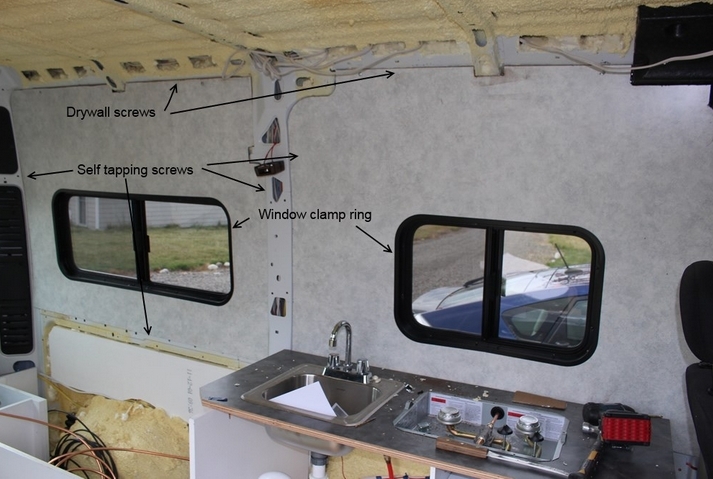 For the window, the window trim ring (or clamp ring) placed over the paneling and pulled into the window frame with screws holds the paneling in place around the window frames. 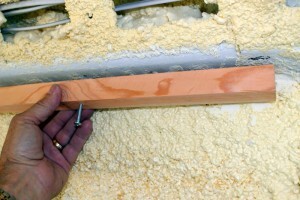 For the areas where wood nailing strips were added (see above), the wood paneling was secured by wood drywall screws. If you do a good job of cutting out the panels, they go up quickly — most of the work is in marking and cutting out the panels and installing the attach strips. First wall panel in place but not screwed down yet — a 2nd panel will go below this one to finish this segment of the wall. In the above picture, most of the screws are not in yet, but the arrows show where each type goes. Most of the exposed screw heads were later covered by trim strips. I looked at a number of ways to cut up panels to fit the ceiling. I even considered making up one big panel in the shop and installing the whole thing as one unit. In the end I went with the same scheme as most of the conversions I’ve seen. You use 4 separate ceiling panels with each panel spanning a pair of the ProMaster metal ceiling ribs. This results in four ceiling panels that each measure about 62 inches side to side, and 27 to 30 inches forward and aft — pretty easy to handle. This seemed like the most straight forward way to do it and looked like it would make the panels easier to cut and fit, and also easier to take out if access is needed to part of the ceiling. One downside is that this method is very wasteful of material if you are using 4 by 8 ft sheets — It takes one full sheet for each of the 4 panels, with only about 12 sqft of the 32 sqft panel being used — lots of scrap for future projects. 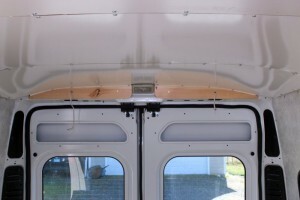 The forward and aft edges of these ceiling panels could be screwed right to the ceiling metal ribs with SHOIRT self-tapping screws, but the left and right sides needed some form of backing board to screw into as did the aft end of the aft most panel and the forward end of the forward most panel. In my case these are all handled with added wooden “nailing” strips. 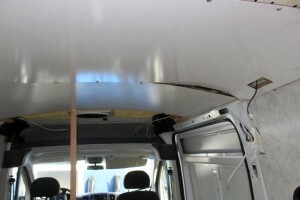 Note that the curvature of the van roof becomes quite tight at the edges of the roof, and the hardboard ceiling panels cannot be bent sharply enough to make this curvature. This means leaving them without support in the span near the edges, or adding a 2nd thicker nailing strip to above the first one to come down and support the ceiling panel in the high curvature section. The side nailing (screwing) strips for attaching the ceiling panels along the sides. Showing how the ceiling panel will come into the nailing strip. 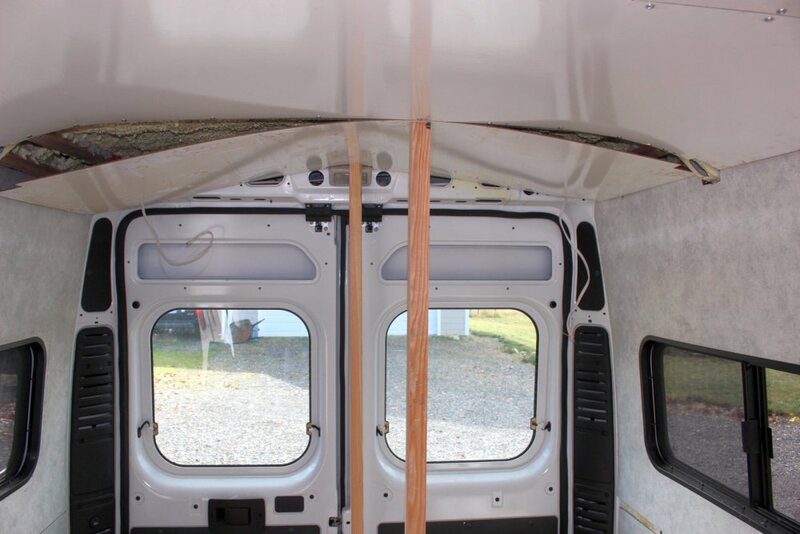 Note how the curvature of the ceiling panel would have to be very tight to follow the van roof contour near the edge of the van — this necessitated a 2nd nailing strip above the first to allow the panel to curve more gradually and not break. I did not want to have to contend with screw heads in these panels, so they were screwed to the van metal (unconventionally) with flat head drywall screws counter sunk in the wood strips — they hold surprisingly well. Second mailing strip to reduce curvature of ceiling panels as they come into the wall. The 2nd nailing strip runs full length of the ceiling along each side above the first nailing strip. If placed as in the picture, it needs to be about 1 1/4 inch thick to allow about the right curvature of the ceiling panel. There would be two of these for each roof rib. While I think this would work OK, the continuous 1 1/4 inch nailing strip shown above appears to be both easier and holds the roof panels more securely. I call all of these nailing strips for lack of a better name — only screws (no nails) are actually used — none were harmed. The aft end of the aft ceiling panel has to be supported by a nailing strip as there is no PM rib to attach it to. Both of the two aft nailing strips. The forward end of the forward ceiling panel also has to be supported by a nailing strip as there is no PM rib at that location. 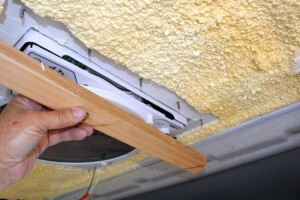 The forward ceiling panel that goes around the Maxx Fan. 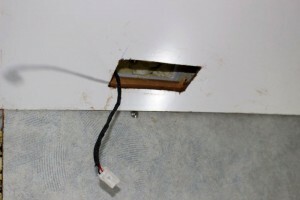 The ceiling panel would cover the PM regular ceiling light, so I cut a hole to fit the existing ceiling light in the new ceiling panel, and reinstalled the old PM ceiling light in the new ceiling panel. 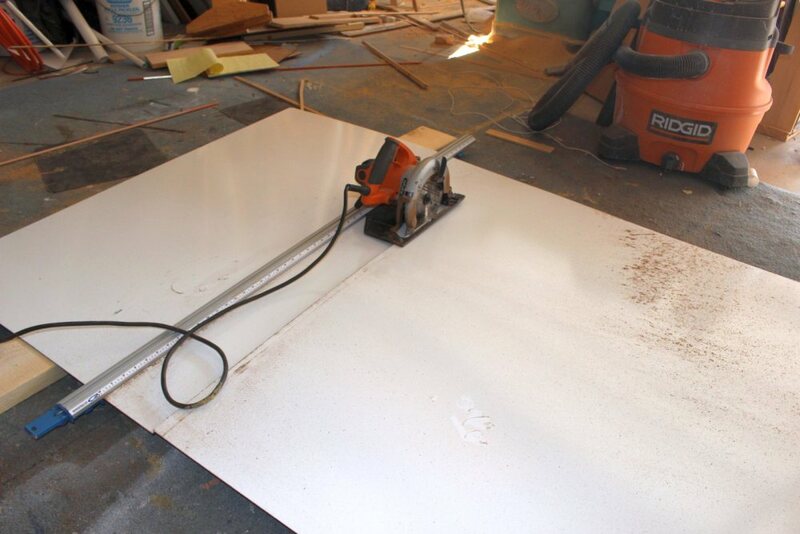 The wall and ceiling panels can be cut quite accurately with a Skil Saw and a straight edge to guide — with a plywood blade, cuts are quite smooth. 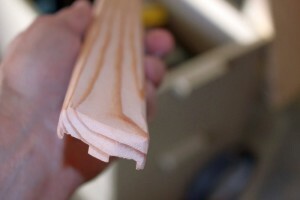 Trimming off the corners and rib notches is easily done with a Sabre saw with a fine tooth blade. Its easier to get the ceiling panels lined up and to get the first couple screws in if you use a couple props to support the panel in place while you fuss with the alignment. Just starting to put up a ceiling panel with the two props holding it in place. Panel with the first few screw in aft edge and prop still holding up the forward edge. Forward ceiling panels in place. 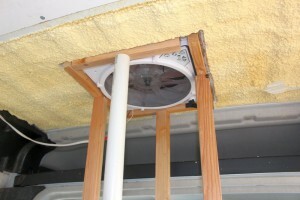 The screws holding the ceiling panel to the wood frame around the Maxx Fan have not been placed yet. More on the Maxx Fan just below. The Maxx Fan (installed earlier) had to be accommodated in the ceiling panel. I wanted the ceiling panels to be supported around the fan opening. 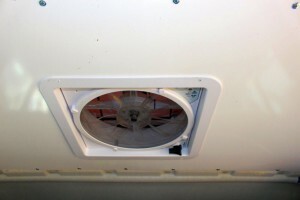 To do this, I glued a wood frame to the van roof metal around the fan opening. Had I thought of this earlier, I would have used the same screws that hold the fan to the van roof to hold the wood frame, but these screws were already installed and carefully sealed, and I did not want to disturb them. 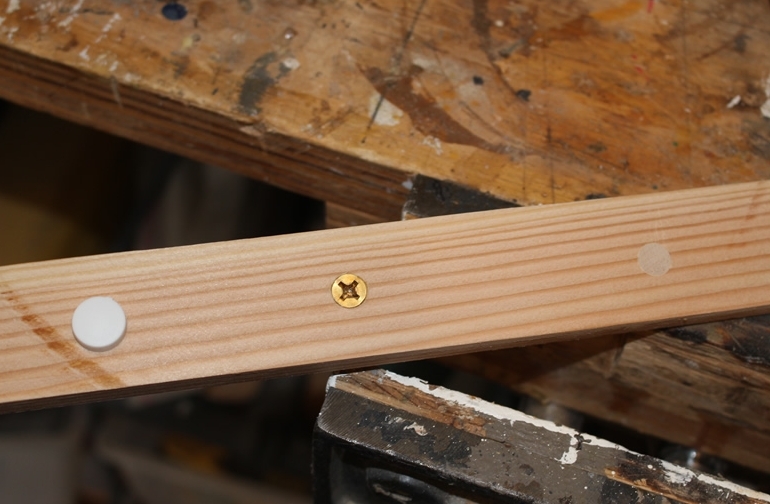 The wood is pressed against the fan mount screws to mark the screw positions, then oversize holes are drilled in the wood to allow the wood to slip over the screws and contact the van ceiling. The polyurethane adhesive used to hold the wood frame in place — this is tenacious stuff. I glued two metal bars together with this as a test and I cannot break them apart. 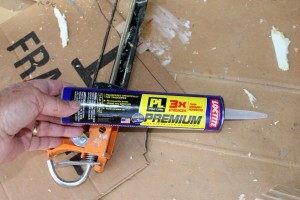 Glue applied to top surface of wood frame. Wood “frame” being propped in place while the glue sets. Maxx Fan decorative frame screwed into the wood frame above the ceiling. Cutting the decorative frame that comes with the Maxx Fan to the right depth. For aesthetic reasons only, most of the exposed screw heads for the screws holding the wall panels in place and the gaps where panels meet were covered with wood trim strips. 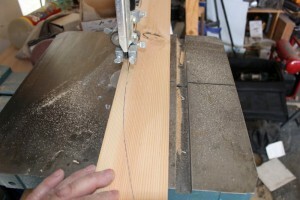 I made the trim strips from Douglas Fir. When I go to Home Depot, I check the 2 by 4 pile and sometimes (at least in our location) you can find some very nice, near clear, and near vertical grain 2 by 4’s — I just pick them up when I see them. The trim pieces for the van were ripped out of some of these 2 by 4’s. They are planned, sanded and finished with three coats of Polycrylic. I like the look, but I’m sure its not for everyone. It does help to have a table saw if you take this approach as there is a lot of ripping. The right photo shows the trim strip in place.The first pictures shows the trim pieces used between the upper and lower panels to cover the edges and screw heads. The two dado grooves are to accommodate the heads of the self-tapping screws used fasten the panels to the PM. The strip is ripped from a 2 by 4. There are a bunch of open holes in the PM back wall just above the back doors. 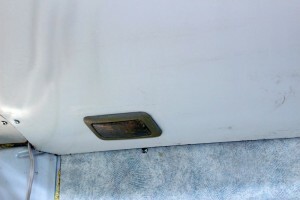 These trim pieces close these off, and also provide a place to install the bed lamps. 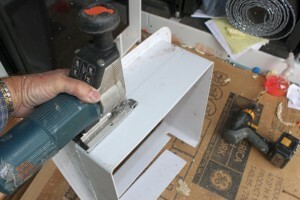 Bandsawing the back trim pieces to shape — a sabre saw would work just as well. The shape of the top was just scribed down to the trim piece with dividers. These pieces are ripped to about 3/8 inch thick by 3.5 inches tall from 2 by 4s. 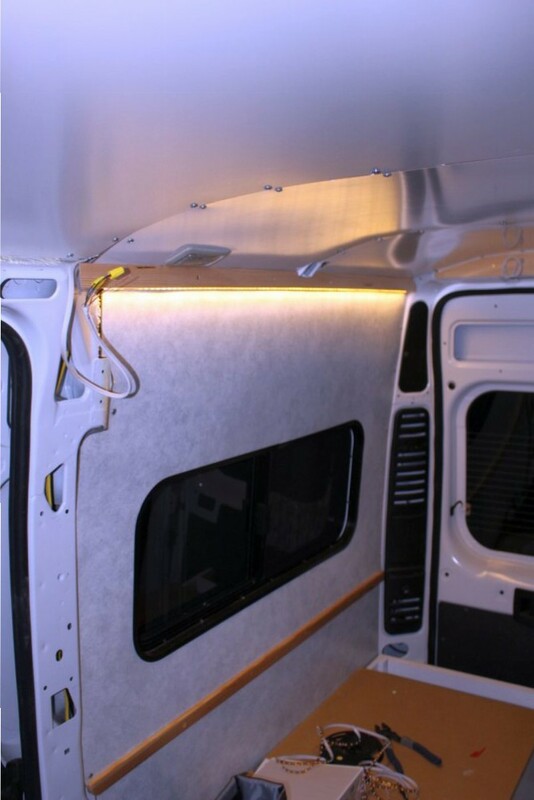 The trim piece that runs along the top of the wall panels over the length of the van hides a bunch of screw heads, gaps, and also provides a place to install down pointing LED strip lights. Shows the upper sidewall to ceiling trim and the over back door trim. While it does not look like it, the right face in the picture above is ripped at an about 10 deg angle to match the side wall angle. The sidewall to ceiling trim pieces had to have notches taken out to fit the ribs and main frame. The wood trim strips that go along the top of the wall panels have a dadoed groove to hold LED strip lights. Shows the LED strip light installed in the groove — its a nice pleasant light. Upper trim strips mostly done. I wanted to either hide or use pretty fasteners on the trim where they show. The left one is a pretty slick fastener head cover, the one in the middle is a #12 brass flat head wood screw in a countersunk hole, and the one on the right is a fastener of any kind with the hole bored down about a quarter inch, and then it has a wood plug pushed into the hole and than sawed of flush. I think they all look nice, but I liked the brass the best — maybe I always wanted a boat? The pictures below show a few small updates we made after a few trips. 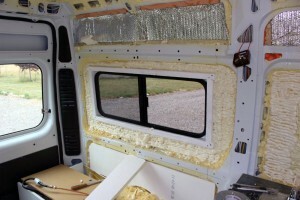 Added insulation inside the back doors and added trim pieces to fill the large holes in the back door above the windows. Added removable shelf between the two beds. Removed the black panels in the back corners and replaced with wood face that allows small storage cubbyholes behind where the plastic panel was. Added a window in the sliding door to eliminate a bad blind spot. 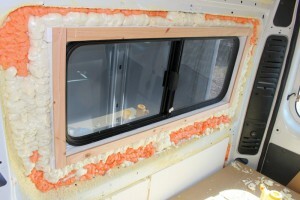 Added noise treatment and insulation to the sliding door, and finished the openings in the sliding door with paneling. Work out what to do over the main frames to cover the exposed frame and all the holes. Probably put some type of fabric over the ceiling panels? Or, redo the ceiling with stained wood strips. I’m not sure about the labor as it was spread out over some no activity on the van periods — I think it was about the equivalent of six or seven 6 hour days. The longest of any job on the conversion so far. I did not take any cost credit for all the scrap paneling I’m left — probably a lifetime supply. Some parts of the wall paneling have developed what looks like water staining. 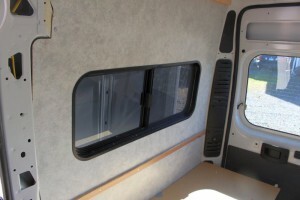 This has occurred below the two aft windows and along the main horizontal longeron on the drivers side. I’ve checked both windows for leaks and I don’t believe that there are any leaks. I think the water staining is probably due to condensation which is happening in these areas where there is little to no insulation, so the inside surface gets cold and condensation occurs on the cold surface. Its pretty ugly, and I will likely replace the panels next summer. Won’t be too difficult since the old panels can be used for templates. Not sure what to use for the replacement as I really like the patterned finish on these. I used 1/4 inch plywood and covered it with upholstery material “outdoor” fabric. When you drill a hole in the wrong place the fabric covers it up. I think it looks like a professional install. I found the self tapping screws would spin the fabric, so I pre-drilled the holes and used small black metal screws. They were less noticeable. Did you glue the fabric to the plywood? With? Thanks Dennis — great stuff! I’m still mulling over the redo of some of my wall panels — like the look of the cloth and also like the look of some of the T and G wood schemes. Hi! I’m so happy to have found your site. Lots of helpful information! Coincidentally we also did spray foam insulation and are thinking of adding some additional material before installing ceiling and wall panels. How did you attach the reflectix on the upper wall? I’m thinking of also adding it to the ceiling. Do you think it will be effective use? As for the wall finish, I plan use 1/4 inch cork panels to 1/8 plywood sheeting. The cork on plywood sounds like a nice way to go and should provide some noise damping as well. Maybe you could send a picture along when you finish it? To be honest, I’m not much of a fan of Reflectex. It has very little insulating value and is really only effective as a radiant heat blocker. To be effective as a radiant heat blocker, it has to be facing an airspace on at least one side. I’m not really sure why I used a little of it, but I’m sure I just glued it to the wall with some Great Stuff, which is a very good adhesive. 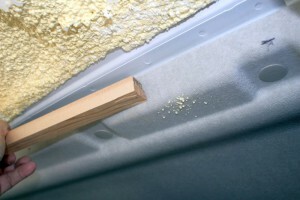 If you want to add more insulation to what you have, I think you might be better off just adding more foam. 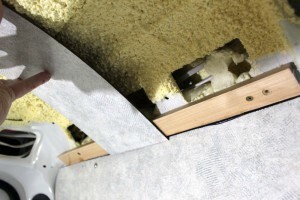 If you do use the Reflectex, make sure that there is an airspace between it and the paneling. Love the site and all the feedback. It has been such a wealth of knowledge. I have used many of your methods on my own build out. That being said so far this is the only area I am going to have to veer from. We installed the exact same panels and while cheap, flexible and nice looking, the durability is not there. We were varnishing our wheel well boxes and so put some painters tape on the panels. It pulled the finish right off. Even a slight rubbing of just about anything pulls the finish off and leaves the brown hardboard showing. I would recommend a thin 1/8″ plywood panel if I was going to start over. Unfortunately our big box store didn’t have anything like that at the time. I agree its not very durable and the finish is easily abraded off or pulled off. The panels are also subject to visible staining with just a bit of condensation. I just hate to give up the nice pattern. 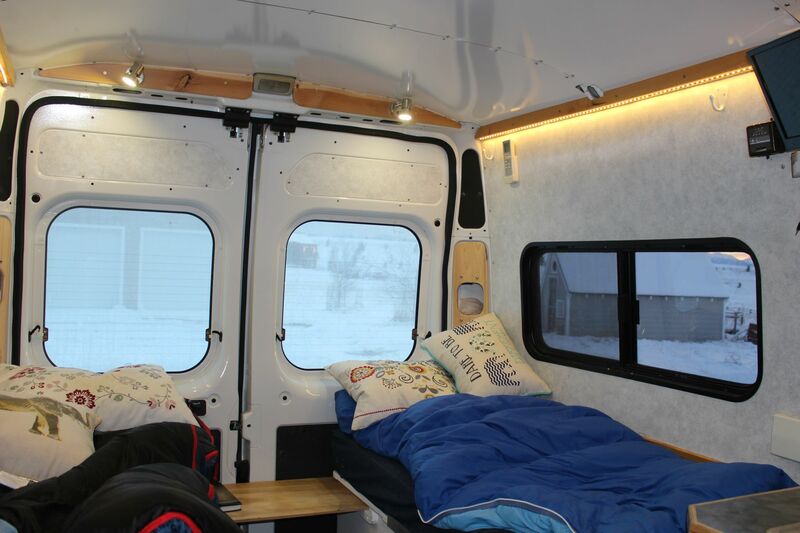 We have had RV’s in the past that had plywood paneling, and just wanted a different look. Maybe someone knows a more durable product with a similar selection of patterns? The plain white paneling we used on the ceiling is much more durable, but not very visually interesting. Agreed, the pattern is very nice. 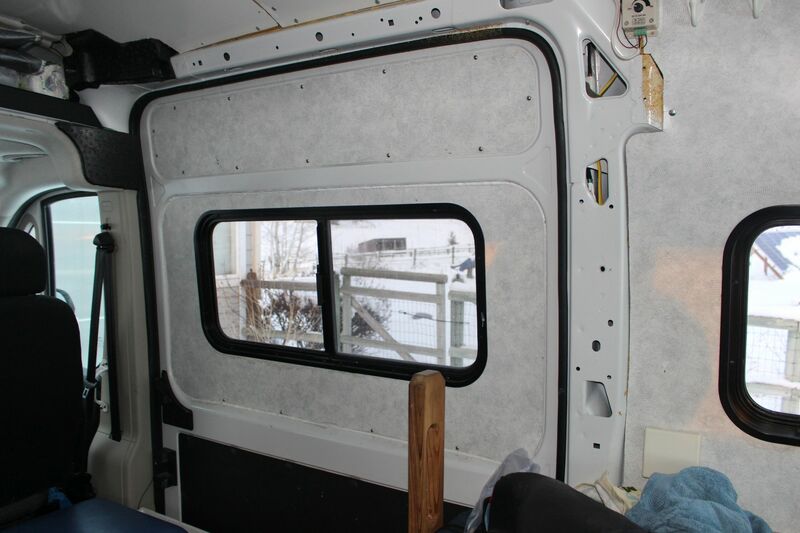 Maybe we should just make a business out of making durable panels for camper vans. So what staining issues have you had? Any other issues over the few years? I am at the tipping point of no return. I can either rip out the whole rear setup and try to get the panels off an put up 1/4″ ply or keep moving forward with these panels. What do you think the best move would be? There is a band of darker material from staining under one of the windows and along the horizontal wood strip about half way up from the floor. They are both about an inch wide and maybe a couple shades darker than the white background (ie not by any means fully dark). My guess is that these are condensation probably caused by there being very little or no insulation under the paneling at these points. I don’t think they are caused by leaks as I’ve checked pretty carefully for this. 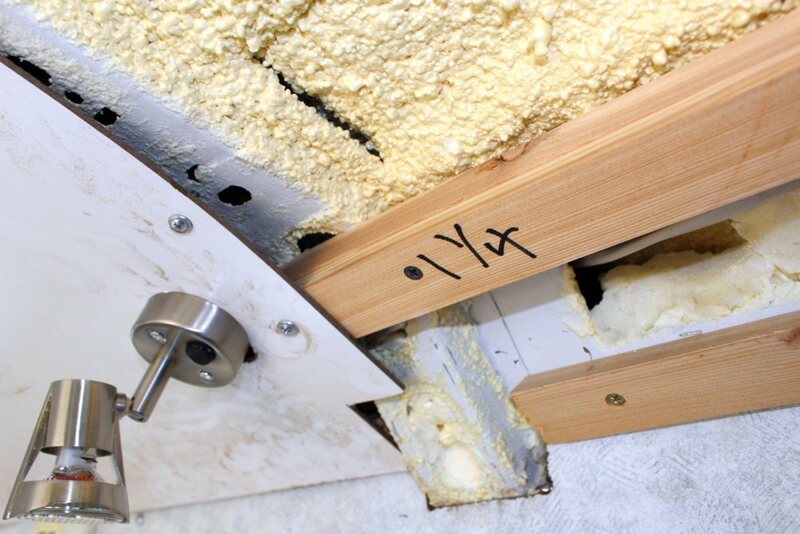 You might be able to avoid the staining by making sure there is insulation right up to the window frame with no cold gaps and maybe a thin strip of foam under the paneling where it goes over that horizontal longeron. I’ve not really had any other issues with the paneling. It is easy to abrade off the pattern, but the only time I got a little of this was when I installed the paneling. If you have bikes or other equipment that you move in and out a lot, the abrading might be more of an issue. I know if I were doing the paneling again, I would try to find something that was a bit more durable. If it does get to the point where we want to change it out, I figure it will go fast as the old sheets can be used for patterns to cut out the new sheets. When we get back home I’ll put up a picture of the staining. Probably next monday or so. I put a picture of the staining in at the bottom of this page, just above the comment section. Looks worse than I remember, and I will likely replace the panels next summer. I think I am just going to keep going with the panels. I just don’t want to rip out the ones we already put in. I am actually trying to figure out what to do for the ceiling, since that is where most of the condensation forms for us. We don’t have any side windows. On the ceiling, I would try to work out a way to put some thin insulation between the panels and the cross ribs and the side frames. This should not only help with the condensation, but also reduce the thermal bridging at the rib locatations and improve the insulation. I’d like to hear how it works out. Thanks for the info on the self tapping screws, the 3/4″ #8 work great. I’ve also been using them to start holes for longer screws needed for the nailer strips. I had some left over Kreg pocket screws that were the right length and they worked great to attach the nailer strips. I also had a couple of questions. I noticed that you put up the wall panels first and then the ceiling panels. Knowing how well you have planned out your build I was curious why you did the panels in that order and if there was a particular issue I am overlooking as to this order of install. Peninsula Glass is installing the Motion Windows in Sept and I didn’t want to wait until then to put in the wall panels so I’m planning on doing the ceiling first. I believe I have figured out that that will work unless I’m overlooking something. One more question; have you put some type of covering over the rounded ceiling ribs where you had to cut the ceiling and wall panels. By the way I have decided to go with the Kodiak “solar generator” for my power as I was a bit intimidated with all the wiring and parts involved with putting together the typical electrical setup, battery, converter, etc. The Kodiak will more than meet our needs and is so much simpler. I don’t think there is any problem with putting the ceiling in before the wall panels. I had planned to come back and cover the ceiling panel joints at the ribs, but have never gotten around to it. It would look better with something to cover the panel joints and attachment screws. I really like your build. I’m going with the DPI paneling that you referenced and the smooth white panels in places that will not be very exposed. I have never used self taping screws so I am lost at to what type and size to use. Some web sites say to use pilot holes and some sources say pilot holes are not necessary? Do you recall what type and size screws you used and did you use pilot holes? Can the holes be reused if you take the panels down? I apologize for all the questions on what seems to be a very simple item, screws. I used #8 self tapping screws — mostly 9/16ths long. From Home Depot. I was able to use them without a pilot hole on the PM roof ribs, but it does depend on the type of metal and how thick it is. Occasionally, a screw would not be able to drill its own hole, and I would just throw it away and use a new one (with sharp tip). If you have not used them before, I’d just try driving a couple in scrap metal to get the feel for them. I have had some of the panels down, and put them back up using the same holes without any problems. You do, of course, have to be careful not to use a screw that is so long it goes through the roof sheet metal. Thanks Gary for the quick reply. You have so much detail on your build it is really helpful. The variable surfaces of the framing members are making it a real challenge to install the wall paneling. I thought working on old houses was a challenge! This wetsibe makes things hella easy. I see you added Reflectex to the upper panels only… would it be ‘better’ to do so all around under the panels, on top of the insulation? I’ve seen it done elsewhere as well…. did you not do the other areas for a reason? Would it help any? In hot or cold environments??? I did not use any Reflectex on any of the wall or ceiling panels. Not really much of a fan of Reflectex. 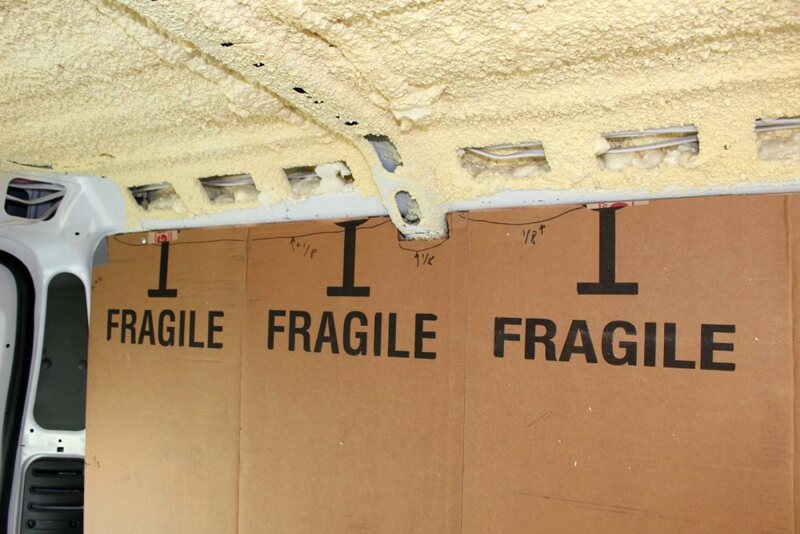 If you add it inside the regular insulation, it would effectively add a vapor battier inside the isulation, so you would have the van skin as an outer vapor barrier and the Rflectex as an inner vapor barrier with the insulation between. Its generally considered a bad no no by the building science people to have two vapor barriers in one wall. 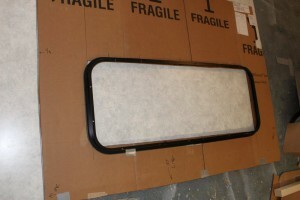 I did use Reflectex for for our window shades. Thanks; somehow I missed that picture. I removed the foam blocks. That conjecture about them protecting heads is one that I simply can’t wrap my head around. An unbelted body would have to move in very peculiar ways to hope to make contact with them way up there. In terms of insulating (foaming in 1″ iso boards) and then paneling, I’m trying to figure out how best to deal with the transition to the cab. Those two black foam blocks on either side up there seem to be awkward and in the way. Do you know their purpose or function? 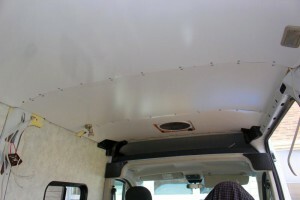 And in order to mount the ceiling paneling, the furthest forward rib is covered by the rear of the over-cab storage space headliner. 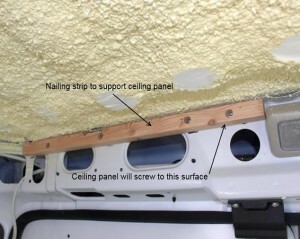 What did you attach the front end of your ceiling paneling to? Did you consider removing the foam blocks to open up more wall area to inflate and to make the ceiling and upper sidewall paneling easier and more consistent? I left the foam blocks in place and notched the wall and ceiling panels around them. I know some people have removed at least some of the foam blocks. There has been some conjecture on the PM forum about what the blocks are for, and the top running theory is that they are there to protect you in case of a crash. Seems a little strange when you look at where they are, but I guess your head can move a lot in an accident? This blog is great. Thank you so much. Much of what is out there really doesn’t provide this level of detail. We are doing a similar build out and considering this window set up. We are noticing that the top horizonal metal framing is a little thicker than the clamp ring windows. It looks like you solved this by adding a spacer to your window frame. However, when you ended up adding the 1/4″ spacer to your windows, wouldn’t that leave a gap between the clamp-ring and the window frame itself? Again thank you so much for sharing all of your efforts. The picture titled “tightening the clamp ring screws” shows the gap between the clamp ring and the window frame pretty well. The gap is about 1/4 inch. The 1/4 spacer is there to represent the wall paneling before the wall paneling is installed — it allows the clamp ring to be tightened before the paneling is installed, but the 1/4 inch spacer is taken out once the wall paneling goes in. I could have made the wood frame that goes inside the window opening a little thinner to reduce the gap between clamp ring and window frame, but I was worried about the wall paneling getting distorted too much by the clamp ring pulling it outward. I guess ideal would be a clamp ring that is designed for a slightly thicker wall, but I don’t think offer one. As it happens, I’m adding the same kind of window to the sliding door today. On this one, I’m cutting the inside wood frame to make the clamp ring fit just right, and then I’m going to put a spacer on the wood frame just out from the clamp ring to bring the wood frame up to where it will meet the new piece of paneling on the sliding door. I did this because the gap would have been even wider on the sliding door window as the paneling will sit further inward due to the depth of the door framing. You could use this technique with all of your windows to minimize the gap between clamp ring and window frame. I’ll try to get some pictures up, but will be a few days as I don’t have the paneling yet. By the way, if you have not ordered windows yet, check CARID for prices of window plus shipping — it may be less than DK. If you order from CARID, make sure they get all the details right — lots of the entries in their online catalog on windows have errors. Delivery time was actually faster than what they promised. edit: you could probably use some black silicone caulk to fill the gap between the clamp ring and window frame — I think this would make the gap near invisible. “Work out what to do over the main frames to cover the exposed frame…”. Have not done anything yet. I think about it once in a while and having been looking for what others have done without a lot of luck. Did add a Victron battery monitor and a TV/DVD for nights — both seem worthwhile additions so far. I agree it doesn’t look bad as is and, as such, the incentive is low… and there is always something else to get done. I also will leave the main ribs exposed in order to maximize the rest of the wall paneling. I’ll re-post here links to pics of my own solution if/when I get to it. I’m deep into the conversion process now and only in the taking picture phase of the share process. I was reading through but didn’t see it, how did you attach that nailing strip to the forward part of the celing? Adhesive? Also, I figured I’d make one post, but concerning the vinyl floor. I just installed my floating vinyl floor, have you seen any bubbles in the vinyl once the furniture was secured over the floor? As the floor expands and contracts? I could imagine it might do this once there is some furniture constraining it at points. As near as I can remember, the forward “nailing” strip is attached to the van with sheet metal screws. The Vinyl floor has been fine — no sign of bubbles. Flat as a pancake. As you no doubt saw, we did not use any adhesive between the Vinyl and the subfloor, and this seems to be working fine. One caveat is that wWe have not used the van in really hot weather. Thanks for the info, it appears like screwing a forward nailing strip would pop through the roof, hence my confusion here! I will float the floor as well. I’ve been struggling with how to panel my promaster and it was a simple solution to what I thought was a problem. The nailing strips!!! Thanks for the write up! This looks great. Such helpful information – thanks for posting! Love it! Thank you so much for writing all of this. I am building out a PM into a mobile boutique and am super lost as to where to start. If I were to go into Lowe’s today for the ceiling panels, what would I ask for? The ceiling (and wall) panels I used are hardboard. The ceiling ones have a white coating on one side and are probably a standard item at most of the big box hardware stores. The wall panels are also hardboard with a coating that has a decorative pattern applied to it. One of our local hardware stores had samples of a dozen or so of hardboards with different patterns — I ordered enough full sheets to do the walls from one of their samples. The hardware I ordered from is not a national one, but you may find the same kind of offering from a place like Home Depot online. 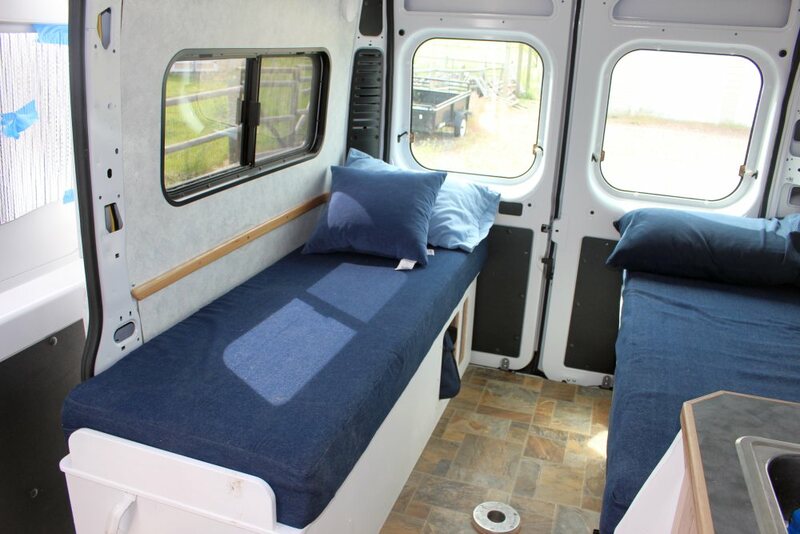 Should also mention that some people who do van conversions use plain thin plywood or hardboard and then apply a cloth coating to it with an adhesive. 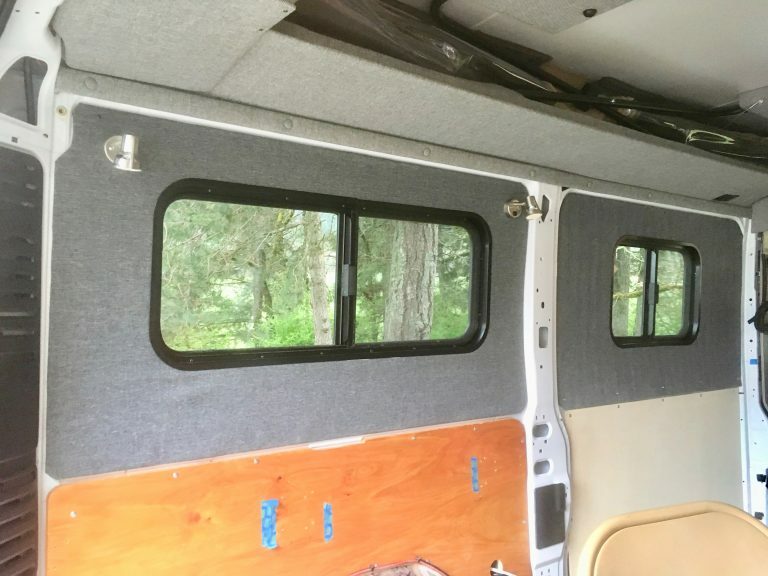 In regards to Installing the paneling section, what about the sheet metal above the rear window that sticks out further than the window frame? I put the same Windows as you and will be using 1/4″ ply. It seems like it won’t be too flush. Thanks! I don’t remember having any problems there, but can’t remember the details around the window that well.